Las Tortugas dates now set: October 29 and 30!!! We will be playing at Las Tortugas Dance of the Dead V on October 29 and 30. Set times TBD. Videos of East Coast tour going up on MoonaliceTV!!! We're back from the east coast, after a very successful run. Most of the shows were videocast live, but Glenn has reloaded them into the system so that there are no synch problems in the library. He just posted the first of these shows, 9/18/10 from Red Square in Albany, NY. This was a particularly fun show for Chubby, as he grew up near Albany. Part 2 is also in the library. More shows to come in the next few days. New Fairfax, CA show added October 23!!! We have added a show at 19 Broadway Nite Club in Fairfax, CA on Saturday October 23. Show time is 8pm. Our gig at the 8x10 in Baltimore is now set for Monday night, Sept 20. Doors are 7pm for an early show. See you there!!! 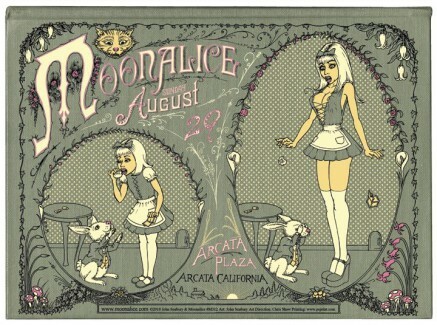 #MZT93 - Twittercast from Arcata, CA 8/29/10 - Links to songs!!! According to Moonalice legend, Humboldt County is one of the Holy Lands for the tribe. It was Moonalice philosophers at Cal State Humboldt who discovered the Moonalice Paradox: one pill makes you larger, but one pill also makes you small. John Seabury's poster illustrates only the second half of the paradox. True to form, this gig in the town square was huge fun. It was the fifth anniversary of Katrina, so we played City of New Orleans as the first encore. Today's show from Monte Rio, CA begins at 5pm PT. 90 minute set. You can watch it live!!!! 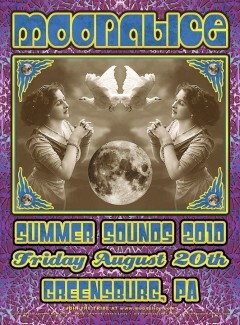 #MZT92 - Twittercast from Summer Sounds, Greensburg, PA 8/20/10 - Links to songs! Greensburg is one of our favorite stops on the summer tour for two reasons: the people and the venue. This was our third visit to Greensburg and 4,100 people turned out. The setting was St. Clair Park amphitheater, which has an expansive lawn gradually fading uphill to a beautiful grove of trees surrounding the Revolutionary War cemetery where the General stands guard. Trains pass by on the other side of the trees, adding the sounds of commerce to our musical program. We love Greensburg and hope they will invite us back next year!!! 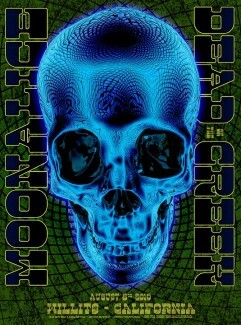 Moonalice to open for U2 in June 2011!!!! We heard the news today, oh boy!!! "Just checking in to make sure you know moonalice is still on-track as the 1st opener for the rescheduled Oakland show on 7 June 2011." If you are wondering about the smallest unit of time in the universe, it's the amount of time it took us to say: "we'll be there!!!" #MZT91 - Twittercast from Dead on the Creek, 8/8/10 - Links to songs!!! 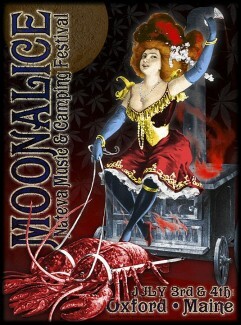 According to Moonalice legend, the Nateva Music and Camping Festival in Oxford, ME was the first festival to offer lobster rolls in the artist catering tent. Unfortunately, we didn't manage to get one. Other than that, everything about the Nateva festival was fantastic!! !